Peir�, D. F., Amaral, G. F. & Saulino, H. H. L. Structure community of aquatic insects associated with different macrophytes in ornamental lakes in a savanna region, Southeastern Brazil. Pan-American Journal of Aquatic Sciences, 10(4): 273282. Download PDF file (942 Kb). Jonsson, C. M., Moura e Silva, M. S. G., Macedo, V. S., Dantzger, D. D., Vallim, J. H., Marigo, A. L. S. & Aoyama, H. Prediction of a low-risk concentration of diflubenzuron to aquatic organisms and evaluation of clay and gravel in reducing the toxicity. Pan-American Journal of Aquatic Sciences, 10(4): 259-272. Download PDF file (302 Kb). Krinski, D., Carmo, E. J. & Miyazawa, C. S. Ichthyofauna of headwaters from Sepotuba River Basin, Upper Paraguay River Basin, Tangar� da Serra, Mato Grosso State, Brazil. Pan-American Journal of Aquatic Sciences, 10(4): 283-292. Download PDF file (1,309 Kb). Rotundo, M. M., Vaske J�nior, T. & Doria, D. M. A. V. S. Report of the butterfly kingfish, Gasterochisma melampus (Scombridae: Gasterochismatinae) in southeastern Brazil. 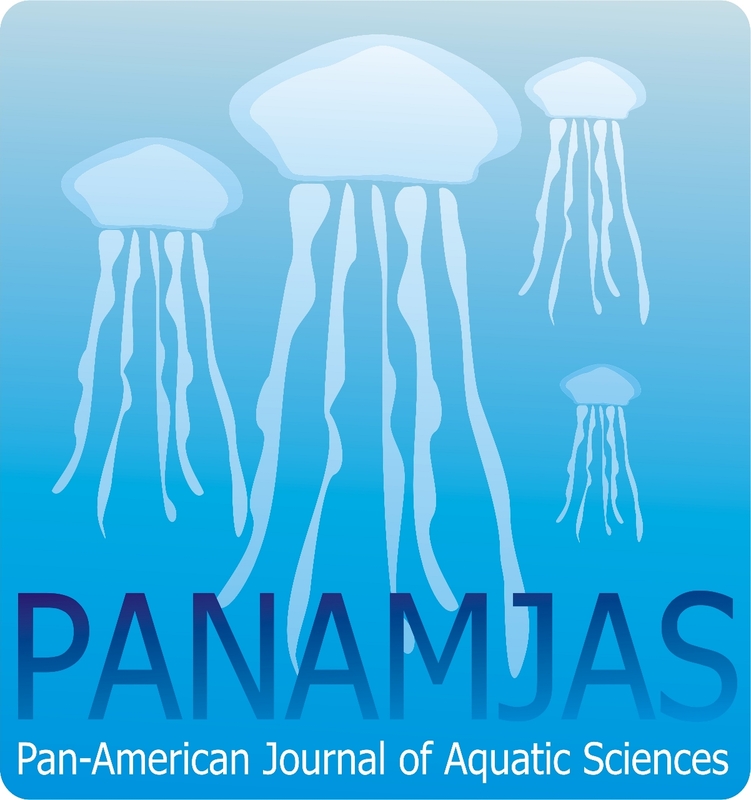 Pan-American Journal of Aquatic Sciences, 10(4): 293-296. Download PDF file (348 Kb). Boveri, M. B. & Binder, P. M. Fish as links between pelagic and littoral zones: feeding strategy of "Sabalito" (Cyphocharax voga) in a mesocosm experiment. Pan-American Journal of Aquatic Sciences, 10(4): 297-308. Download PDF file (708 Kb). Valls, F. C. L., Basler, A. B., Santos, C. R. & Petry, M. V. New record on the occurrence of Northern Giant Petrel (Macronectes halli) and analysis of stomach contents in Southern Brazil. Pan-American Journal of Aquatic Sciences, 10(4): 309-314. Download PDF file (2,018 Kb). Burns, M. D. M., Correa, F., Cheffe, M. M., Foster, J., Lopes, J. B. & Santos, J. D. M. The fish fauna of Turu�u river, Patos-Mirim lagoon system, Rio Grande do Sul state, southern Brazil. Pan-American Journal of Aquatic Sciences, 10(4): 315-322. Download PDF file (796 Kb). Vitule, J. R. S., Freitas, M. O., Ribeiro, V. M. & Bornatowski, H. First records of Sigmodontinae (Mammalia) predation by Oligosarcus hepsetus (Cuvier, 1829) (Characiformes, Characidae) in Atlantic Rain Forest rivers of southern Brazil. Pan-American Journal of Aquatic Sciences, 10(4): 328-331. Download PDF file (346 Kb). Velasco, G. & Oddone, M. C. Record of a massive Myliobatis goodei and M. ridens discard in Cassino beach, Rio Grande do Sul state, southern Brazil, SW Atlantic. Pan-American Journal of Aquatic Sciences, 10(4): 332-335. Download PDF file (921 Kb).